Ferry Faizal (doctoral student) presented “Decomposition of solution droplets under the influence of thermal convection over a heated horizontal plate” in the 7th Asian Particle Technology Symposium (30 July – 3 August, 2017 at Chang Gung University Campus, Taoyuan, Taiwan). Our talk was invited and published in APT2017 special issue (Advanced Powder Technology). 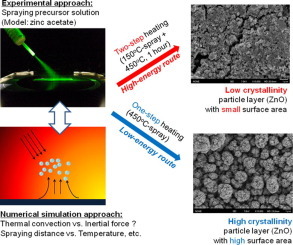 The role of thermal convection on reactive spray deposition over a heated plate. Nozzle-to-plate distance affecting morphology and size of deposited particles. Discovery of a low-energy route to layer of nanometer-sized particles with high crystallinity. Previous postOpen Lab (4 Aug. 2017) for high-school students and parents.